FairLifts arranges aerial helicopter pipeline services that can help out any gas or oil operation. The services are completely customizable and available throughout the state of Rhode Island. A few of the services include leak detection and emergency response, transporting cargo, and helping transport crew members. FairLifts is connected to a wide network of pilots and experienced crew members to help you out wherever you need helicopter services in Rhode Island. Rhode Island’s Port of Providence is a vital place when it comes to the heating needs of the entire New England area. The port provides a key place for transporting fuel products. However, Rhode Island does little to contribute to the carbon dioxide emissions in the United States; it is the second lowest carbon dioxide emission state in the country. In 2017, natural gases fueled 92 percent of the state’s net electricity. A helicopter can assist with transportation efforts and provide crucial inspections for gas and oil operations. If you are looking for aerial pipeline inspections and other services, FairLifts has you covered. We proudly arrange helicopter services in Rhode Island to benefit oil or gas operations. Our connections use technology to deliver accurate pipeline surveys. One such technology is LIDAR which provides a 3-D image of terrain. Federal regulations by the Pipeline and Hazardous Materials Safety Administration (PHSMA) require pipeline inspections, making them a legal requirement of many gas and oil operations. There are federal regulations requiring regular pipeline inspections for oil and gas operations. FairLifts gladly assists in helping you get these pipeline inspections completed. 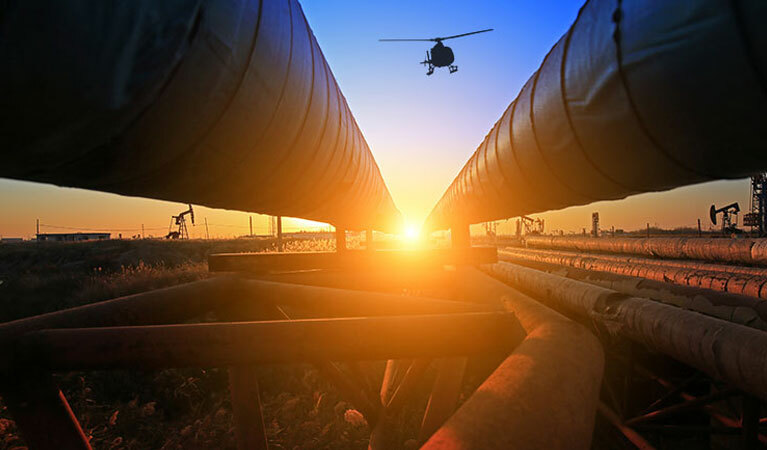 Our vendors implement the latest helicopter technology to provide you with an accurate pipeline inspection for your oil or gas operation. A helicopter is a great machine for transporting cargo. While a helicopter may look small, it can lift tremendous amounts of weight and deliver cargo to exactly where it needs to go, providing quicker shipment methods than those on the ground. Detecting leaks early on is important in any gas or oil operation for both environmental reasons and to not lose out on profit. A helicopter can assist in detecting a leak and can further help by providing crucial emergency services to help repair a leak as fast as possible. If you are looking to transport crew members to a difficult to reach location, a helicopter can help out in a major way. A helicopter’s precise flying ability makes it a great asset in transporting work forces and can easily move crew members to where they need to go, including to offshore locations or over bodies of water. Experts are standing by to get you a fast quote for your pipeline survey in Rhode Island! FairLifts likes to help out gas or oil operations in the state of Rhode Island. Call us today to reserve aerial pipeline helicopter service to help your operation. We have team members standing by, ready to assist you by answering your questions or providing you with a quote for a helicopter service. Because we are about your convenience, our lines are open 24/7 every single day. Our connections to a wide network of pilots and crew members make scheduling your helicopter service simple.